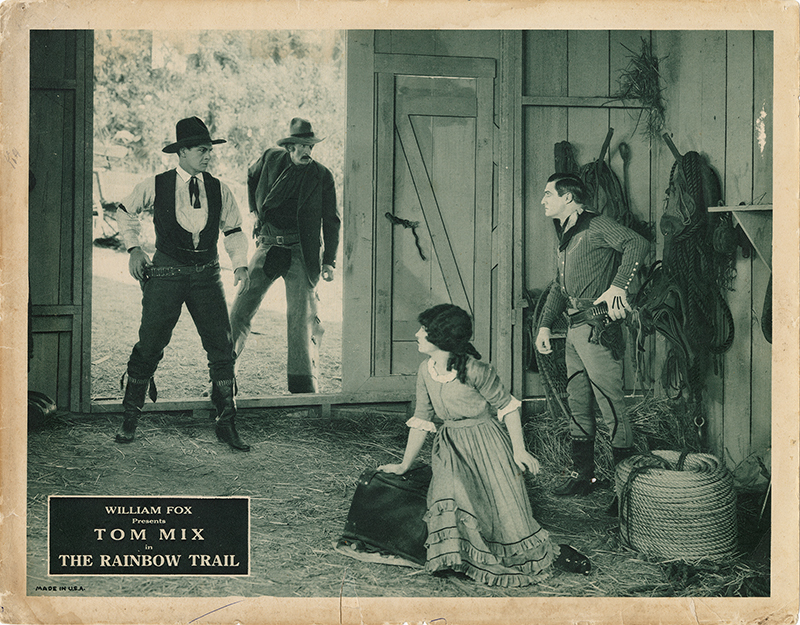 SCVHistory.com LW3225 | Film-Arts | Tom Mix Stars in 'The Rainbow Trail,' Fox 1925. "The Rainbow Trail" was the type of action-packed (if inauthentic) Western feature that kept audiences glued to their seats and made Tom Mix a big star of the Roaring Twenties. It also marked a departure from the stoic, moralistic plays of William S. Hart which, like World War I, were fading from view. After this picture was released May 24, 1925, Mix's renegotiated contract with William Fox's film company took effect. His salary was raised to $6,500 per week through the end of the year, increasing to $7,500 weekly in 1926. Mix was splitting his time between Southern California and the Phoenix area when this movie was made. According to Birchard (1993:123), "The Rainbow Trail" was filmed in Arizona. Mix was pretty much done using the Newhall area by this time; the lion's share of the work was done at the Fox lot in Glendale. "The Rainbow Trail" also features Diana Miller, Anne Cornwall, Lucien Littlefield, George Bancroft, Thomas Delmar, Vivien Oakland and Fred DeSilva. Uncredited cast includes Mix's horse, Tony (somewhat unusual not to be credited), along with Mabel Ballin, Steve Clemente, Fred Dillon, Mark Hamilton, Carol Holloway and Doc Roberts. LW3225: 9600 dpi jpeg from original lobby card purchased by Leon Worden.